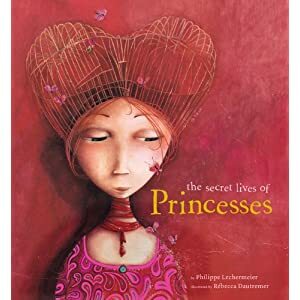 The Secret Lives of Princesses (written by Philippe Lechermeier, illustrated by Rebecca Dautremer) is an encyclopedia-style storybook with information about some little-known princesses who are just as royal and magical as your classic fairytale princesses -- but a bit more, ah, shall we say, interesting. It also contains some fascinating details of princesses' lives, from how they travel to what kinds of pets they own, as well as tips and tricks for how to wake a sleeping princess, how to appease unhappy fairies ready to hand down curses and more. Everyone knows about Cinderella, Snow White, and other princess favorites -- but others, equally magical (and sometimes, a lot funnier) have remained anonymous, enigmatic, and far from the fairy tale crowd. Now these captivating ladies are finally stepping out of the shadows where they've remained hidden for far too long. WIth imagination, sublime humour and beautiful art, The Secret Lives of Princesses introduces a bevy of new royal daughters to the court of young readers. Princess Anne Phibian, who kisses every frog she sees. Princess Hot-Head, who would rather brandish a sword than an embroidery needle. Each illustration in the book is so whimsical and delicate and beautiful, it's tempting to tear the pages out and frame them up on The Pea's bedroom wall. But I won't because it's such a humorous book; even grownups will appreciate the tongue-in-cheek wit. I love that the princesses in this book break the stereotype of the helpless, victimized princess who needs a prince to rescue her and bring about a happy ending. Yes, these princesses are kooky, but they're ultra-cool, and best of all they are confident in who they are and not afraid to revel in it. What a great girl-power message to pass on to the little princesses in our own lives! This book almost seems to be geared more towards adults than kids. It uses a lot of big words, idiomatic expressions and cultural references, so I found myself having to take more time than usual to explain to my kids what the book is saying. Not that that's a bad thing, but when you're reading this to younger children you may find yourself picking and choosing the passages you read out loud just because the rest are too complicated to bother explaining. Again, I guess it's not really a bad thing -- they can read it themselves when they're older and rediscover the book! The Secret Lives of Princesses is a witty, beautifully illustrated collection It's the perfect book for any princess lover.... or princess hater! One lucky Bonggamom Finds reader will win a copy of The Secret Lives of Princesses. Go to The Secret Lives of Princesses portrait gallery, then leave a comment on this post and tell me which princess in the gallery you would most like to be. This entry must be completed before extra entries qualify. 7) Go to The Secret Lives of Princesses portrait gallery, then go to the Being a Princess Facebook Fan Page and write on their wall telling them which princess you would most like to be (1 entry). Disclosure: I received a review copy of this book, and a second copy will be provided to the giveaway winner courtesy of the publisher. I was not paid to review the product or give my opinions. Unless clearly stated, the views and opinions expressed here are my own. In my younger years I was like Princess Meetu. Wrote on Being A Princess Facebook Page! I would be "Princess Anne Phibian! Im most like Princess Somnia. I love my sleep. I wrote on the Being a Princess facebook fan page. I wrote on Facebook's Being a Princess fan page about which princess I would most like to be. Following you on Twitter (@csaulpaugh89) and tweeted. Unfortunately, I'd probably be Princess Oblivia. I would be Princess Paige - I've always been a bookworm. I am SOOO Princess DoReMi!!! I even once played the cello! I now follow you on Blogger! I would like to be Princess Do-Re-Mi! Princess Somnia does sound like a lucky girl! I'd probably like to be her!! Princess Meetu sounds like an interesting one to be. Thanks. Please please please let me be princess Somnia! I would most like to be princess claire voyant! I would like to be Princess Paige. She gets to read a lot. I subscribe to Bonggamom Finds updates via email. This book looks great. I most resemble Princess Paige! I'm always reading when I should be doing other things. Congratulations to the winner: #35, Dolphin Girl!